Sensory impulse - Visual Dictionary - Copyright © 2005-2016 - All rights reserved. [img]https://infovisual.info//storage/app/media/03/img_en/040 Sensory impulse.jpg[/img] [url=https://infovisual.info/en][/url] - [url=http://www.infovisual.info/]Visual Dictionary[/url] - Copyright © 2005-2016 - All rights reserved. Sensory impulse: phenomenon of polarization and depolarization through which the abnormal acticity of a fibre spreads through a nerve. 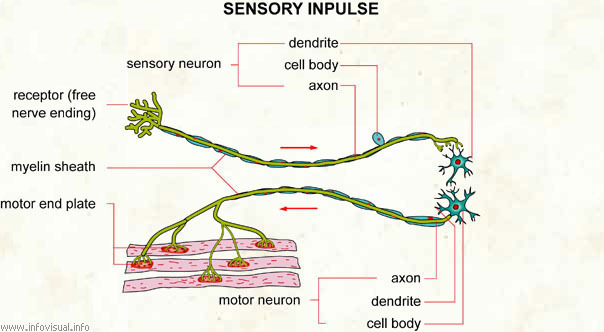 Sensory neuron: nerve cord carrying sensory stimuli to the brain. Dendrite: cytoplasmic extension of a nerve cell. Cell body: part of the nerve cell between the axon and the dendrite. Axon: extension of a neuron. Motor neuron: nerve that produces muscular activity. Motor end plate: muscular organ that becomes active in response to stimuli. Myelin sheath: envelope of phosphorated fats. Receptor (free nerve ending): receiver of nervous stimuli.